Imperial Engineering has specialised in the machining, welding, fabrication and straightening of PSV and commercial vehicle components for over 50 years. Our reputation for engineering excellence has been built by employing traditional engineering skills and techniques, as well as consulting closely with our customers. This ensures that we continue to meet and exceed their repair and quality standards for bespoke and cost-effective solutions. We take pride in the personal nature of our service. Imperial’s team of experienced technical support engineers can handle a wide range of repair and rectification work at our own workshop facility in Cheshunt. We are also able to undertake specialist welding, such as aluminium, cast and tig welding. Front Axle Beams – stabiliser/torsion bar holes rebuilt and crack tested; king pin holes bored and sleeved; cotter pin holes re-drilled; spring saddles rebuilt; alignment and straightening. Trailer and Rear Axle Casings – oil seal and bearing positions rebuilt; threads built up and re-cut to correct TPI; spring and pad locations re-drilled; crack testing and straightening. Anti-Roll Bars and Panhard Rods – bored and sleeved; built up and machined; alignment checked; swivel bushes fitted where supplied; crack tested. Torsion Bars – new bushes fitted; stub axle assembly rethreaded (jig mounted); new tubes welded; stub axle alignment checked. Oil Sumps, Crankcases, Clutch Bell Housings – cracks detected, preheated and welded without distortion; datum faces and mounting faces skimmed; crack tested. Hubs – inner and outer bearing and oil seal positions rebuilt; stud holes built up and machined to standard. Cross Members – shackle pinholes rebuilt; tubes rewelded; straightening undertaking if required. Brake Drums and Flywheels – faces skimmed to O.E. specification. Brake Camshafts – bearing positions rebuilt and machined; ‘S’ – cam profile checked; ground finish. Brake Shoes – ‘S’ – cam roller slot rebuilt (jig mounted); crack tested. King Post and Stub Axles – bearing positions rebuilt; threads built up and re-cut; re-shimmed and machined as necessary; crack tested. 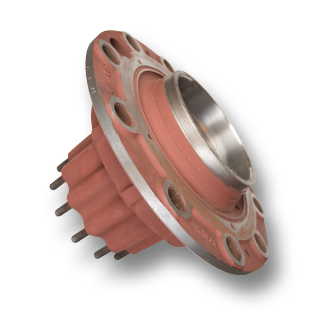 Gearbox Casings and Diff Housing – bearing housing rebuilt; cracks detected, preheated and welded without distortion; re-sleeving and studding as required; datum and mounted surfaces skimmed. Planet Carriers – a complete overhaul undertaken; service/exchange facility available. Fluid Flyweels – complete strip down and rebuild including replacement of glands, bearing, gasket and stripped studs; all aluminium casings and flywheels built up and machined to standard; thrust plates replaced. Supply Pipe cleaning – unblocking of carbon-filled supply pipes.